Other option is the storage media. For 150 € you will grow to 2 TB of hard drive (150 €) or we may prefer only SSD storage with 256 GB (500 €). It is however very little in terms of storage for a high rate, especially if one collects photos and video. The more affluent will have the option to combine a hard disk with a SSD, which will host the system and applications (marriage of storage capacity and speed of execution) but must pay dearly again. Has 600 € to 1 TB + 256 GB SSD or 700 € for 2 TB + 256 GB SSD. These two combinations also currently lead delivery times higher, 4 to 6 weeks. Finally, the choice is given (without influence on the final price) for a wired keyboard (with numeric keypad) or wireless (without keypad), a wired mouse or touches the Magic Mouse and Bluetooth or the touchpad and wireless Trackpad Magic. If we want both the Magic Mouse and Trackpad Magic, count an additional 69 €. € 200 separates this iMac model just below the screen with 21.5 ". On the essential characteristics, they are identical. To work with an iMac 27" (Core i7 Quad) since 2009 it is difficult to find complain about this diagonal screen. Some may find the unnecessary or cumbersome. It is true that this declination iMac does not accommodate a small office and there must be a minimum of recoil. In summary, if your budget allows and that the 27 "does not scare you, no hesitation in having this machine is a small bomb. Otherwise, the 21.5" reconcile more affordable prices (1149 and 1449 €) to possibly inflate the memory or hard drive) with quite satisfactory performance. Another point to note with this hard drive and more generally with this iMac, it works quietly. In a quieter environment, we launched a Flash playback 1080p on YouTube, iMovie and encoding a copy of a large folder of files, everything went without one is a particular annoyance came from fans or Disc. While an iMac 27 "Core i7 of 2009 will be much more remarkable for its breakdown. 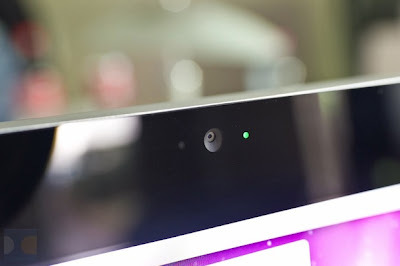 This iMac also differs from its predecessors by adding a light sensor next to the webcam. It automatically alters the brightness of the screen. She is still alive; some coping with this very well, others will find it too strong to its maximum setting. So there is a new option to automatically adjust in System Preferences. Another development is the presence of the connection to Thunderbolt. Except that Apple has not provided a connector on the iMac as 21.5 "but two. Sign it considers this series of iMac as suitable for certain professional uses where the Thunderbolt will make his debut, including video. But in the meantime, the two acquisitions have nothing to put in their mouths. We must remember that the use of this iMac as a screen of another Mac (target mode) is possible that using a Mac Thunderbolt too. At the time of ordering, the customer some options. Like go to 8 GB memory (16 GB max). If one spends most of his time on the Internet, the 4 GB may be enough. It is recommended that in contrast to climb to higher level when working with many applications open. We can happily adjust its configuration in a second time. Of the four memory slots, two are vacant, so we can add strips later, and look for any tariffs more competitive than the Apple Store (200 €). The installation itself of these bars is relatively easy. As long as you have the right screwdriver, simply remove the small grid in the screen and drag strips in their new homes. It's a matter of ten minutes. If one compares the first i5 Quad 2.7 GHz 2.5 GHz to previously tested on the iMac 21.5 ", the gains in performance, predictable, are confirmed in almost all applications. There is no exception with Aperture to export the same time. Elsewhere, the differences are sometimes marked. But with Blender (3D), iPhoto, XLD (audio encoding) or Starcraft at native resolution of the screen, the differences are smaller, if not minimal. The finding is more vindictive to the very first iMac 27 "Quad. A high-end model features a 2.8 GHz Core i7 released in fall 2009. Our" small "i5 the distance in all cases Figure (some tests fail, we added some applications since then). 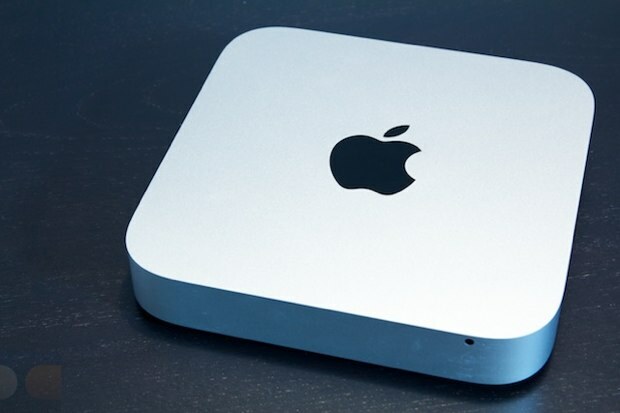 Faced with the Mac Pro entry level, a Xeon 2.8 GHz Quad, same thing, this iMac is held upright, into the processor and testing Cinebench OpenGL. The hard drive is a Western Digital (WD1001FALS-403AA0) to 1 TB 7200 rpm. 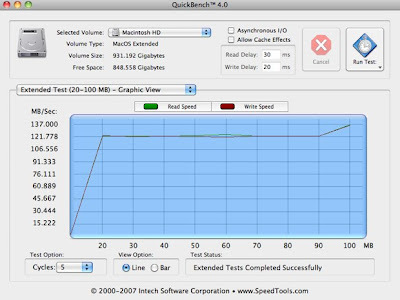 QuickBench test with large files to an average of 124 MB / s read / write. It's better than the 500GB model fitted to the 21.5 "which is turned around 112 MB / s. All this confirms, if need be, the idea that this family of iMac is perfectly complete semi-professional tasks like 3D, DTP or video or music. In the latter two areas, however, specialists rather demanding swear by the Mac Pro. But for the general public, the iMac 27 "have all the comforts. The model tested is the entry level of the new iMac 27 "Thunderbolt, with its standard configuration. This machine has sold € 1649 i5 Core 2.7 GHz quad core "Sandy Bridge" (i5-2500S), 4 GB RAM, 1 TB hard drive at 7200 rpm and a new graphics card Radeon HD 6770M with 512 MB of RAM. Defining its beautiful screen has not moved with 2560x1440. The working surface is always as comfortable if not impressive for a piece. The iMac lineup includes, at the base, four models: two 21.5 "(i5 Quad at 2.5 or 2.7 GHz) and two 27" (i5 Quad 2.7 GHz or 3.1 GHz). Performance processor reported here should therefore provide good clues about what we can expect from the 21.5 "high end. Because there are many common points with our machine: processor, memory allocation, hard disk and graphics card. If found the note that 27 "too high or if its dimensions alone are a constraint, we can always turn to the iMac just below. Which may also receive a Core i7 Quad 2.8 GHz if you really want to push performance (allow € 200). Core i7 has this and more on the i5 that supports Hyperthreading (eight cores logic with some applications) in addition to Turbo Boost available to all iMac (able with this machine, on tasks not taking advantage of multicore to push a temporary heart increments, up to 3.7 GHz maximum). In the standard tests, a mixture of consumer applications or not. - Finder: zip archive of a file of 1.5 GB and 4500 elements. - GarageBand '11: AAC encoding a 30-minute podcast. - Photoshop CS4 and CS5 two scripts, one mainly composed of filters (DHT), the mixing filters and other common actions (RAT). - IPhoto '11: export JPEG images. - Aperture 3: export RAW images to JPEG. - IMovie '11: 960x540 exports in a HD movie of 10 minutes. 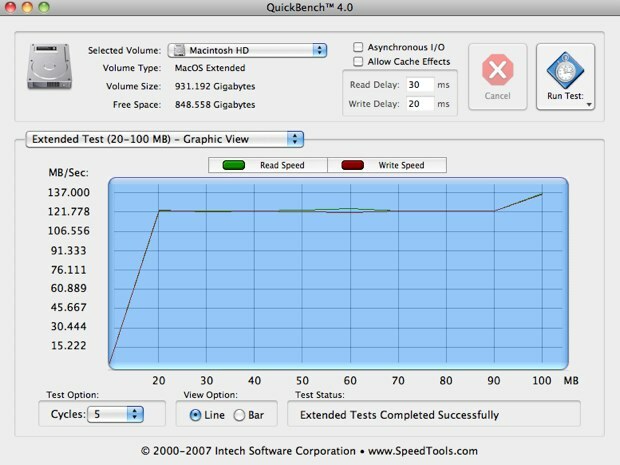 - QuickTime X: export to iPhone format film obtained with iMovie. - Blender 3D rendering of a file. 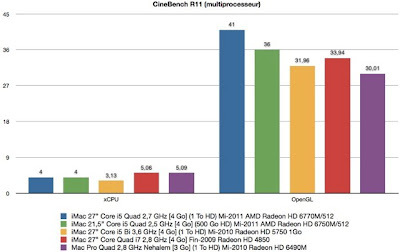 - Cinebench: measurement of an animation and an OpenGL 3D rendering.